Intergeneric hybrids consist of several different genera that are can be crossed together to create new "man made" intergeneric orchids. 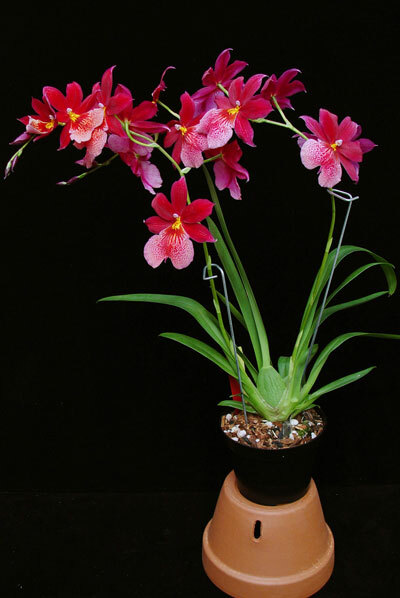 Cochlioda, Miltonia, Odontoglossum, Oncidium and Ada are some of the genera that are commonly used. The result of these hybrids leads to new genera names that can get pretty confusing. Some common intergeneric names are Vuylstekeara (Vuyl. ), Colmanara (Colm. ), Odontonia and Adaglossum. You will commonly see "mericlones" of intergenerics as they are very easy to clone and produce high quality/high quantity plants. Use GrowMore 20-10-20 Ureafree for municipal or well water. Use at the rate of ½ teaspoon per gallon. As Intergeneric hybrids are composed of several different genera, they can tolerate a wide range of light. For best results, as a general rule of thumb low to medium light (1000-2000 footcandles) works best. Most Intergeneric plants will develop black spots on the leaves if they receive too much light. However, Intergenerics generally have black spots on the leaf tips. These plants also grow well under artificial lights. L.E.D. Grow Lights are a great way to provide artificial light to your orchids. See our L.E.D. Grow Lights page for more information on the great bulbs we offer. 50% or higher is ideal. Humidity is not top priority for Intergeneric orchids. However, healthier growths generally develop with higher humidity. We offer two products that can help increase humidity levels. The humidity tray offered in black or white, and the Mist Maker. Please click on the underlined text for more information on these products. Intergeneric orchids have a wide variety of shapes and colors. They often bloom twice a year. Most intergenerics can bloom twice a year, producing several flowers from a multi-branched flower spike. Flowers generally last for about 2 months. Intergeneric plants do well in regular orchid bark medium. They also enjoy growing in New Zealand sphagnum moss when they are in smaller pots. We offer several different types of potting medium. Here are direct links to what we believe to be some of the best potting mediums available for orchids: Orchids Limited bark mix, New Zealand sphagnum moss, coco husk, coco peat, sponge rock, charcoal, tree fern fiber, osmunda fiber and cork slabs for epiphytic plants.